Climate change researchers and activists say the debate is over on the science of global warming but deniers of the evidence think a 15-year pause in temperature rise is reason enough to keep questioning conclusions. On Friday, the Inter-governmental Panel on Climate Change will release its summary for policy makers of the physical science basis study. This study is the first part of the IPCC's fifth Assessment Report. And the contributors admit there isn't much of a change from their last one, which they released in 2007, beyond the fact that they are even more certain about their science. "It further affirms: a), that we have seen a changing climate, b), that a lot of that is because of us [humans] and, c), if we don't do something about it we're going to be in serious trouble," explained John Stone, one of the authors of the IPCC's fourth report in 2007 that won the group the Nobel Peace Prize. He peer reviewed the IPCC's latest report. Skeptics like David Kreutzer of the Heritage Foundation in Washington admit the climate is warming but don't see catastrophe on the horizon. "The question is how much is it warming? How dangerous is that warming? And how much can we do about it and at what cost," Kreutzer asked. He says he's worried that trillions will be spent to solve a problem that isn't that severe and probably can't be solved by humans anyway. Kreutzer and other skeptics like him don't feel the urgency that climate scientists do when it comes to acting on their findings. "They [IPCC scientists] talk about the great confidence they now have in their projections even though the models since the last one have gotten worse in terms of predicting reality because we've had a levelling-off of worldwide temperatures in the last 10 or 15 years," argued Kreutzer. Stone is disappointed with the way the IPCC is explaining the so-called "temperature hiatus." 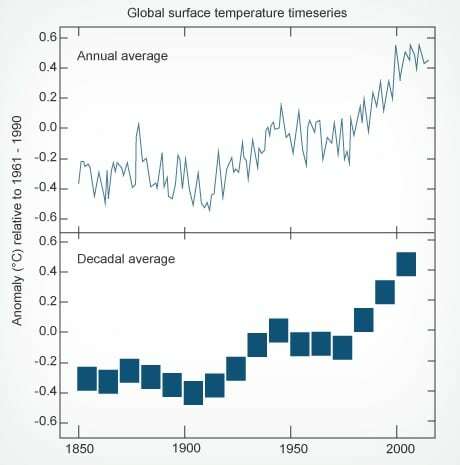 That is the 15-year period between 1998 and the present where the temperature of land and air have flatlined. 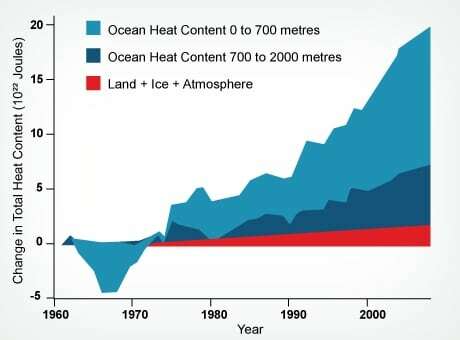 Oceans are taking more of the heat that was absorbed by the atmosphere and land prior to 1998. There is still natural variability in temperatures and that natural variability is currently masking the human effects on the climate. That is to say, if there wasn't so much human-made carbon dioxide in the air, it would be a lot colder. The Sun radiates energy in cycles. We are currently at a low energy ebb in that cycle. "But to be honest, there's not a clear consensus among the scientific community," said Stone. Still, Stone asked deniers and those who might be swayed by their arguments to look at the temperature record over 150 years and not just the last 15. "Over that period, there is no doubt that the Earth has warmed to as much as a degree since the pre-industrial time. But that curve is not smooth. There are variations in it," argued Stone. Environmentalists like Christian Holz say climate change deniers like the Heritage Foundation "deal in doubt" and are just mouthpieces for the agendas of big oil companies. "By cherry-picking one measure out of a number of them, it's quite clear that an agenda is followed. 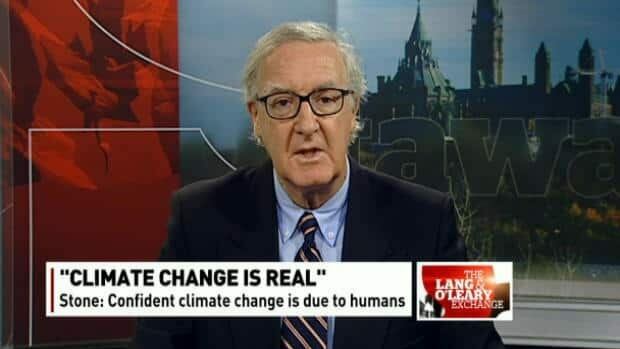 Especially since they use this one measure to conclude that the IPCC are wrong," said Holz, Climate Action Network Canada's executive director. Holz admits, though, that a big part of the work going on before the release of the report is how to explain the "temperature hiatus" clearly. 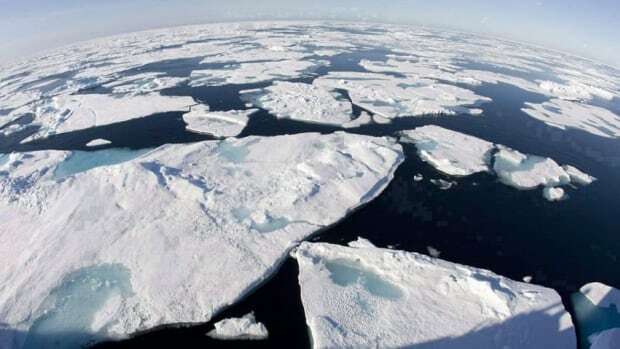 The IPCC's summary of its science report for policy makers will be released Friday.